On July 1st the Verdon College 1st XV set off on their 2009 Australian tour. Following stop overs in Christchurch and Wellington the team arrived to a warm Brisbane evening. After getting settled, the team ventured into Surfers Paradise for tea and a tentative look at the local wares. Practice took precedence on day two followed by the first shopping expedition to Australia’s largest mall, Pacific Fair, where the boys assisted the Australian economy out of recession. A trip to Harbour Town and further retail therapy was in order and then on to Brisbane to watch the Warriors play the Broncos at Suncorp stadium, where 32,000 people turned out to watch a club game of league. Many of the boys would like to return and see further games here. Following an intense practice on Saturday morning the boys relaxed by attending surf school in the afternoon. Many were first time surfers left with the skills to stand up and hang ten. Corrumbin was the venue for the Tens Tournament. We entered two teams. The B team struggled having only two backs and therefore had a very make-shift back line. The 4th game of the day resulted in their only win of the tournament. The A team had a very easy tournament, winning all their games by 40+ points and winning their division. Movie World was the scheduled attraction for the next day. The boys went nuts on the rides trying to scare each other. All enjoyed the day and were reluctant to leave. Dream World was the highlight for many. The rides proving to be a real challenge for some who returned looking very white and quiet. 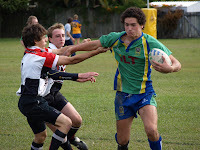 The first day of the fifteens was played at The Southport School (TSS). We played Northside Christian School, winning both of these games comfortably. Day two of the fifteens: We enjoyed further success with two wins. Flu was starting to hit a number of the boys and this was now proving to an issue. Finding enough healthy bodies was a challenge. Friday was the last opportunity for any further retail therapy and exchanges. The boys were given the opportunity to rest and they did this with zest; some not surfacing till lunch time. The Carnival Dinner was held at Movie World. 1,200 people sitting in the main street and being served under the sun shades. It was a cold evening but the boys took the chance to mix and mingle with the other rugby players and girls from the various netball teams attending their local tournament. Finals day was ironic. The team had travelled to Australia to play Central Southland College whom we drew with 6 all. Verdon went through to the final due to superior pool position. The final was with Roncalli who gave us a lesson in rugby. The boys should be pleased with their second placing at this tournament. It was now time to consider heading for home. Thanks go to our Coach, Manager and Staff for a great trip.